WHO PUT THE PSYCHEDELIC IN PSYCHEDELIC ART? I have been very busy of late, actually working on a rock-concert poster project. I thought some of you might appreciate the following thoughts. If there is one artist who put the psychedelic in the psychedelic art era (the 1960s), in my opinion that artist is Rick Griffin. And if there is a single poster of Griffin's that best sums up his psychedelic statement, it has to be this one, which has been nicknamed the "AOXOMOXOA." 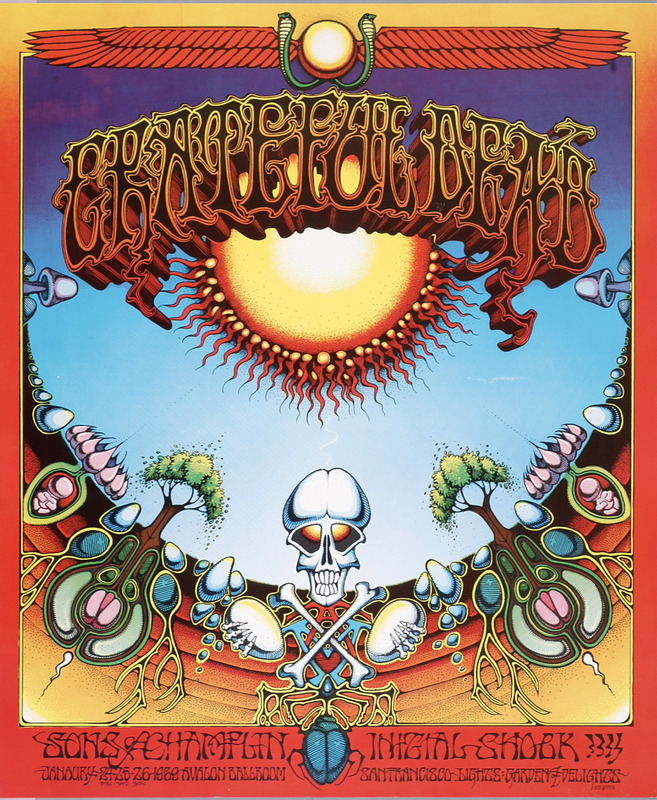 Griffin's flying eyeball (BG-105) may be the most universally recognized of all the psychedelic era posters, but the AOXOMOXOA most perfectly represents what that era was all about. The word "AOXOMOXOA" is a double palindrome, meaning not only does it read the same forward and backward, but also each letter in the word is also reversible, and when flipped horizontally also reads the same either way. As the story goes, "AOXOMOXOA," was an idea given to Rick Griffin by Grateful Dead lyricist Robert Hunter, when Griffin phoned him up and asked him for a possible title for the new Grateful Dead album cover Griffin was working on. Hunter suggested that he put a lot of the palindromes that Griffin had been playing with (words like 'mom,' etc.,) together to form a larger word. "Dead Heads" have speculated as to the possible meaning of the word, with thoughts like the "AO" means "Alpha and Omega," the sacred seed syllable "OM" is in the center, "X" is a mysterious number to be solved for, and so on. Others have speculated that this is an Aztec or Mayan word. Beyond the words is the actual imagery created by Rick Griffin, and it says it all. Griffin's incredible sun (an egg surrounded by sperm wriggling to get in) burning in a clear blue sky, endlessly radiating light and warmth above, while warming the earth below where the most dark womb of the earth receives that light and (also endlessly) brings forth life. Here is the mystery of life and death drawn out in psychedelic imagery worthy of Carlos Castaneda and the mysterious world of Don Juan. This poster has an immediate and a lasting impact on our consciousness. For me, it is unique in the world of psychedelic posters and is the single most important graphic from that era. Called the "Hawaiian AOXOMOXOA," this is a poster for a show that never took place. Rick Griffin hand carried 25 back from Hawaii himself on the plane. The printer destroyed all the other copies because he was never paid for the gig. Of the 25 that were salvaged, there were four printer's proofs, three on the same stock as the posters and one on a slightly different stock. These 25 were the only originals of this most classic poster. There have been two reprints, one that is smaller. The AOXOMOXOA for the Grateful Dead Avalon show on January 24, 1969 is considered by many collectors (including myself) to be the quintessential statement of psychedelic art. This Hawaiian show is the only other Griffin poster that reflects the same Carlos-Castaneda-style psychedelic landscape and sun, first seen in the poster for the 1969 Avalon show and later on the Grateful Dead album "AOXOMOXOA," released in June of 1969. Although elements of what can be seen in the AOXOMOXOA posters can be found in other griffin works, these two posters are his only work with a fully developed sun and surrounding landscape. The Hawaiian Aoxomoxa is one of a few (and perhaps tops that list) of the most coveted and rare psychedelic posters. One poster collector that I know, a man who personally assembled the largest collection of rare psychedelic posters in existence, is reputed to have the Hawaiian AOXOMOXOA framed and showcased above his mantle. This can be said to be a quintessential piece. I have studied these concert posters for many years and have assembled what is probably the largest single database of rock posters in existence, personally photographing more than 30,000 posters myself. Of course I owned a mint copy of the AOXOMOXOA and I also owned one of the very few proof sheets of the Hawaiian AOXOMOXA. A proof sheet contains the poster image and often several handbills or cards. Here is a photograph of my proof sheet, which I sold for $20,000 some years ago.